Steve has gone above and beyond to get my wedding dress preserved. He kept me updated throughout the process, and sent me pictures of what my dress looked like after everything was completed. He was in constant contact to get my dress back to me as soon as possible, and even hand delivered it to my front door. That is great customer service! I would recommend his business to anyone. Wonderful experience! After much research..I found Chicago Wedding Dress Cleaners. So very happy with Steve and the amazing service and quality of work! I had worried about trusting anyone with my two daughters wedding gowns. After talking with Steve on the phone, I felt immediately that this was the place I could trust. Wonderful service..and our dresses are perfect..boxed beautifully and preserved! Such a pleasure to work with a really professional yet personal company! Highly recommend trusting Chicago wedding Dress Company with your precious gown! I am so happy I found them! Chicago Wedding Dress Cleaners was amazing! I couldn’t be happier with the process. Steve was AWESOME, communicating with me every step of the way. They picked the dress up, sent me pictures when it was cleaned and before it went in the box, and then delivered it right back! Such a smooth and easy process. I felt so comfortable with Steve and his team handling my dress. Would recommend them to anyone! Steve was incredibly easy to work with and did an excellent job on my wedding dress. It was a seamless process with him literally coming to my door to pick up and drop off my dress. I’d recommend him to anyone looking to preserve their wedding dress. Just awesome service. He came to pick up the dress the same day I called, kept us informed throughout and sent us pictures before he boxed it. Great service! Take your dress here and have it done right! I had a great experience with Chicago Wedding Dress Cleaners. Steve was responsive and professional throughout the process, and I’m very satisfied with the quality and final preservation box. Highly recommend! I am highly recommending and mentioning you to anyone interested in listening! You did an amazing on cleaning the wedding dress and you are extremely accommodating to my busy schedule. Above and beyond! I felt completely confident leaving my daughter’s very expensive and ornate gown in the care of this company. It is obvious that they are very experienced. Very friendly, efficient and incredibly convenient. Using Chicago Wedding Dress cleaners was incredibly easy and my dress looks brand new! I was originally nervous about getting my dress cleaned because it is all lace with intricate beading and details but it’s also a sample from a salon so it really needed a good clean. I’m really glad I went with this company – they were super easy to use and did an excellent job with a tough dress! Steve is so friendly and very communicative. He picks up the dress and drops it off, making it super easy. Did a lovely job cleaning my dress. Thank you! Steve and the team at Chicago Wedding Dress Cleaners were incredible to work with going out of their way to ensure my experience was top notch. I’ve already recommended multiple friends and new brides to this company! Your dress will be well cared for and this team will make sure that you are taken care of as if you were family from start to finish! Highly recommend! All around wonderful experience! Steve is very accessible and responds right away. It was so convenient to have my dress both picked up and dropped off! Highly recommend. Thank you! Steve and his staff were amazing and so accommodating! They did a BEAUTIFUL job getting the dirt off of my dress after walking around a farm for pictures and made it look brand new and preserved. I drove 2.5 hours out of my way to get my dress cleaned here and it was well worth the trip. I would highly recommend these guys for anyone who wants the best top quality for wedding dress preservation. I knew after my wedding that I wanted to get my dress cleaned and preserved, but was so nervous about letting another company handle my dress after I have heard so many horror stories from friends and family. After doing a ton of research, I found this amazing company and called the owner Steve to find out more information. I instantly felt comfortable after spending a short amount of time on the phone with him, especially since he told me that he would personally come and pick up my gown, send photos during the cleaning process, and then deliver it himself back to me. At my wedding we had some brief rain that wet our outdoor dance floor, so by the end of the night my dress was black at the bottom. It was so upsetting and I didn’t think it was possible to get it back to it’s original state, but this company made my dress look brand new again! They even sewed some tears on my gown for a small fee. Do not look any further than this company when it comes to cleaning and preserving your dress. They are truly the best out there! Chicago Wedding Dress Cleaners was professional, convenient, effective, and well-priced. Steve came and picked up my dress from my house (super convenient). I was sent pictures of my dress after it was cleaned (they were able to get red wine stains totally out). Once I approved the dress cleaning from the pictures, I was then prompted to pay – I appreciated that I didn’t pay until I saw the results. After I approved and paid, they boxed it up and Steve once again dropped it off right at my house. The box its in has a window so I can still admire my dress. I was very impressed and will be recommending Chicago Wedding Dress Cleaners to my friends! Fantastic quick easy great service! Great experience and great service! Had been researching dress cleaning and preservation services online and came across Chicago Dress Cleaners. Called to inquire and Steve picked up my dress the same night! Cleaning was prompt and was also sent photos of the final product. Steve then dropped off my dress once complete! Great service! My dress was black on the bottom and it’s perfectly white again. Would highly recommend! Chicago Wedding Dress Cleaners was great! Excellent service. Steve came to our home to pick the dress up at a schedule that was convenient for us and then he sent me photos when the dress was cleaned up, I approved, and then they put it in the sealed box. Then Steve delivered the dress back to our home. My dress looks beautiful and I can still show it to my friends because the box has a window. The price was also very reasonable. Overall I am very happy I chose to his company to clean and preserve my dress and I recommend them highly. After walking around downtown Chicago after the wedding in flat shoes, the dress was black. Steve’s people amazingly got it white again. We’re very happy! I had the pleasure of working with Steve from my initial phone call to my dress being completed. Steve was amazing, responsive and professional. They did a wonderful job on my dress and this was an extremely convenient service, as Steve picked me dress up from my home and dropped it off when it was complete! Very easy to work with, good price compared to other options. I called Steve at 9:30am on a Saturday morning and he was at our home by 11am to pick up the dress. Steve was prompt and a pleasure to work with. I highly recommend Chicago Wedding Dress Cleaners! I was so happy with my experience- I had been putting off getting my dress cleaned for years because I didn’t want to have to haul it somewhere and then go pick it up (an extra pain now with a baby in tow). Steve made the process super easy and was able to pick my dress up the same week I called. While the dress was being cleaned, we moved to the suburbs and he delivered it to our new house for us. My dress looks great and I’m so glad it is now preserved and safe! This company is highly recommended very professional did a wonderful job with my 50th Anniversary dress. They cleaned it, boxed it and it came out Simply Beautiful. Steve the owner was absolutely wonderful, he came and picked my dress up from my home and dropped it off too, so convenient for us busy ladies! Great service, staff is friendly and sends updates on your dress, love them! I can’t say enough positive things about Steve and his staff. Gives the utmost personalized attention and level of customer service from picking up my daughter’s wedding gown and my gown, to calling me and advising me about special considerations and providing me with updates and reassurances. My expectations were exceeded. Very Nice people. I couldn’t be happier with the service and professionalism from Chicago Wedding Dress Cleaners. There was detailed and timely communication from start to finish and I am extremely happy with the finished product. I am so happy I chose to send my dress to them! Loved the work Steve and his team did. He was very thorough in his explanation of what he was going to do, very punctual for pick up and always called back right away! Amazing customer service and I’d definitely recommend them. Dress looks great. Easy to work with, attentive and quick. They explained the process from beginning to end during first conversation. Picked up the dress, let me know status along the way, and dropped off the dress at my home when complete. I wanted to leave a review because I have had such a positive experience working with Chicago Wedding Dress Cleaners! Steve was so accommodating and came to my home numerous times, making the process so easy to have my wedding dress picked up, cleaned, preserved, and dropped off! My dress was 7 years old and had never been cleaned or preserved in any other way then the original hanging bag. There was some discoloration where stains were and it honestly looks brand new!! I am so impressed and really can not say enough good things about working with Steve during this process! I would absolutely recommend their services to anyone! It’s difficult to entrust sentimental items like a wedding gown to someone to clean and preserve. Chicago Wedding Dress Cleaners did a meticulous and wonderful job with our outfits. Great personable service! 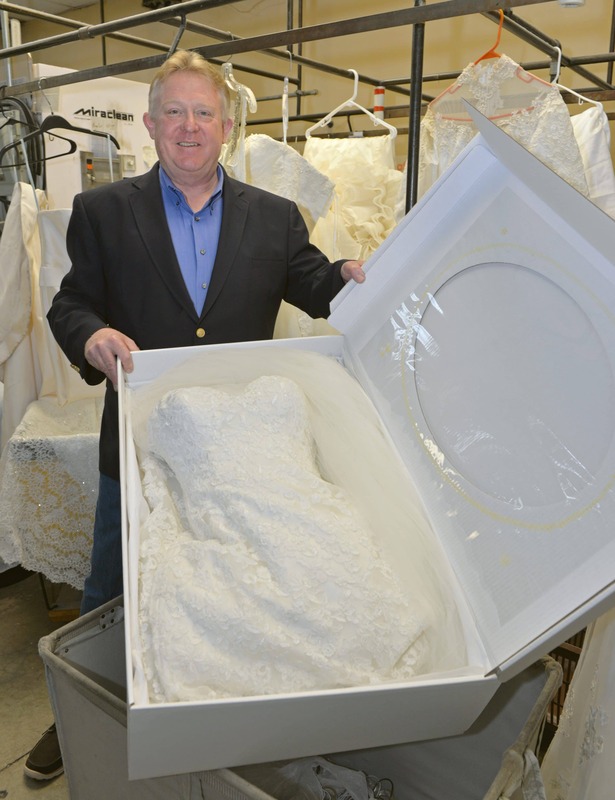 Steve and his team did an excellent job with cleaning and packaging my wedding dress. He came to my house and picked it up the day I called, kept me posted with the cleaning process including sending pictures for my approval prior to packaging my dress, and delivered it back to my home. I would use them again in a heartbeat… but don’t anticipate having another wedding dress that needs cleaning. Instead, I will just recommend Chicago Wedding Dress Cleaners to every bride I know! Thank you Steve! Thanks Diane it was a pleasure serving you. They were great picked up and delivered the dress to us. They sent pictures throughout the process so that we could see the condition of the dress before sealing. Chicago Wedding Dress Cleaners literally saved my special day! I couldn’t find any place in the Chicago area with a short turn around time, as I needed my dress as soon as possible. I found these guys via google and put all my trust into Steve and his team and I am SO glad that I did! The pick up and delivery service is super convenient and the quality of the cleaning and pressing of my gown and veil are superior! I have nothing negative to say. If you’re in need of these services, look no further. Amazing, friendly and trustworthy service! Steve and his team were so friendly and professional. They picked up my dress on Christmas Eve, sent me pictures as they were cleaning it and returned it all within a month. I would highly recommend using Chicago Wedding Dress Cleaners. Hi Steve, thank you for sending over these pictures! The dress looks so great and so clean! I can’t believe you were able to remove all those dirt stains. Excellent! Glad I went with Steve and his people. Recommended to me by my friend who got married last year and used Chicago Wedding Cleaners. They picked up my dress and saved me headaches, living in the city. My dress was delivered perfectly preserved in the window box. Looks lovely! It looks lovely! Thank you so much Steve! Thank you! Looks good, I’m happy with It ! Steve- this looks great, thanks.